Kate Cowles, 2019. Photo by Julia Poska. Hydrologists can never completely predict when flooding will strike. Conservationists can never be sure how chemical spills will impact fish populations, nor can anyone really foretell how extreme the effects of climate change will be. That’s why environmental researchers need statisticians like Kate Cowles. “One of the hallmarks of statistical work is assessing realistically how much uncertainty remains,” said the University of Iowa professor of statistics and biostatistics. Cowles’ was first introduced to environmental statistics when another environmental statistician, her early mentor Dale Zimmerman, called on her expertise in Bayesian statistics. Together they calibrated four methods of measuring water held in snow across the western U.S..
https://iowaenvironmentalfocus.files.wordpress.com/2019/03/cowles-background.mp3Cowles began her career as a piano teacher…how did she get here today? Listen to her describe her fascinating journey. Notably, Cowles was director of GEEMaP (Geoinformatics for Environmental and Energy Modeling and Prediction), a value-added graduate program funded by the National Science Foundation. Before it ended last summer, GEEMaP brought together faculty and graduate students in fields like statistics, civil and environmental engineering, mechanical and industrial engineering, computer science, geoinformatics and geography. The problems they discussed and solved exposed students to real-world problems and gave them a strong grounding in statistics and geographic information systems (GIS), Cowles said. Every project promoted interdisciplinary collaboration. Cowles said a class she teaches on Bayesian statistics, her specialty, also resonates well with engineering students. The Bayesian approach allows users to quantify what they do and do not know and update their understanding as more information comes in. Cowles believes it parallels the way engineers think and lends itself well to engineering problems. She is always excited to advise engineering students and further promote collaboration with statisticians. “I think that it is crucially important for those two types of data analysts to work together and communicate with each other,” Cowles said. https://iowaenvironmentalfocus.files.wordpress.com/2019/03/cowles-correlation.mp3 Hear about a possible application for Cowles and her student’s spatial correlation software. Calculating that relationship requires complex statistics, but failing to account it properly can lead to faulty conclusions. “Statistical methods that help us draw the right conclusions for complex data like that are becoming more and more important,” Cowles said. One of Cowles’ graduate students is developing software that “mops up that spatial correlation,” making things easier for non-statisticians making predictions based on spatial data. Processing such enormous datasets is slow work, however. In many cases, engineering methods like machine learning are faster than statistical methods, which Cowles said creates tension between disciplines. https://iowaenvironmentalfocus.files.wordpress.com/2019/03/cowles-gpu.mp3 Listen to Cowles explain how she hopes to speed up complex spatial processing. Another large part of her work focuses on activating underutilized graphical processing units inside computers to do many simple computations simultaneously, which can speed up the processing of such data. “Statisticians need to catch up, because engineers and environmental scientists cannot wait for a long time for results of their analyses!” she said. Matt Hill, 2019. Photo by Julia Poska. In their relatively short residence on Earth, humans have survived several dramatic climate change events, albeit with more natural causes than at present. They have endured man-made environmental challenges, like deforestation, as well. So could the key to modern climate adaptation lie in the triumphs and mistakes of ancient civilizations? Matthew Hill, associate professor of anthropology at the University of Iowa, sees potential. Anthropology, broadly, is the study of human cultures. Hill primarily focuses on human interactions with the environment. As an archaeologist, he spends a lot of time studying ancient peoples and their technologies—specifically, how indigenous hunters interacted with animal populations in North America. https://iowaenvironmentalfocus.files.wordpress.com/2019/03/hill-ancient-research.mp3Hill describes his research on ancient North American peoples and animals. One of his earliest studies involved North American bison. They sustained native populations in the Great Plains for tens of thousands of years but declined rapidly once Europeans joined the hunt. Hill sought to understand the differences in strategy and mindset that led to dramatically different outcomes for bison before and after colonization. About half of Hill’s recent research focuses on modern humans, too. With an interdisciplinary team of Iowa researchers, he is studying the social and environmental positions of wood-burning stove users in rural India. “We’re trying to understand how these women are coping and adapting to a changing environment, one in which there’s deforestation and one in which governments and international organizations are targeting their way of life for change,” he said. https://iowaenvironmentalfocus.files.wordpress.com/2019/03/hill-india.mp3 Hill discusses his research on biomass burning in rural India. Adaptation is the common thread throughout Hill’s projects. In both past and present peoples, he has examined a number of successful and failed strategies for dealing with all sorts of environmental problems. As he sees it, innovation is not an issue. He said people have always been clever and able to develop new technologies and approaches. The bigger problem seems to be motivating political and economic elites to work towards positive change. https://iowaenvironmentalfocus.files.wordpress.com/2019/03/hill-on-division.mp3 Hear Hill’s thoughts on the political reality of environmental action. The masses often have more incentive –they are harmed by environmental isues far more than elites – but the poor and disenfranchised typically lack adequate resources to be a “positive push forward,” he said. It is up to leaders to be proactive and implement solutions that work for everyone. But still, successful adaptation is possible. Hill pointed to North American big game hunters as evidence. At the end of the paleolithic Ice Age they faced mass extinction of food sources like mammoths and mastodons. Amazingly, they managed to “not just survive but thrive,” he said. He attributes thoughtful resource management and long-term planning to their success. Cwiertny, Dalrymple and Jones answer audience questions on nitrate pollution in Iowa (photo by Julia Poska). Urgent environmental challenges like climate change have made it increasingly vital for the public to know the facts. General audiences get information largely through news media, but distilling complicated science accurately is not always easy for writers. Friendly collaboration between scientists and journalists is crucial, for the sake of accuracy and public good. An Environmental Journalism Summit in Grinnell, Iowa brought students and professionals in both fields together Tuesday to share thoughts on improving environmental science communication. The University of Iowa’s Environmental Health Sciences Research Center organized the summit and presented on three “hot topics” in environmental news. Peter Thorne, head of the UI Department of Occupational and Environmental Health, spoke about his experiences advising the EPA under changing administration. Dr. Robert Blount discussed his medical research on air pollution and tuberculosis. Darrin Thompson, associate director of the UI Center for Health Effects of Environmental Contamination (CHEEC), shared his knowledge and research on neonicotinoids, a controversial class of pesticides. Two expert panels shared their knowledge and answered questions from moderators and audience members. The “Science and Media” panel featured Iowa Public Radio’s Amy Mayer, journalism professor Daniel Lathrop, Iowa Watch executive director Lyle Muller and engineer Craig Just, who discussed the complexities of communicating science. They stressed the importance of fact checking, including people in storytelling and maintaining responsibility to the audience. Another panel focused on nitrates and water quality, featuring IIHR research engineer Chris Jones, CHEEC director David Cwiertny and Kajsa Dalrymple, who researches media effects on agricultural practices. They discussed gaps in coverage of the issue, the magnitude of the problem and the complex system that created it. Researchers also participated in more journalistic activities, like generating story ideas on hog manure. The summit ended with a showcase on Cedar Fall High School’s news team, which has published award-winning investigations on pesticide drift, climate change education and drinking water nitrates through Iowa Watch. Ananya Sen Gupta, 2019. Photo by Julia Poska. Ananya Sen Gupta’s entire career may have looked very different had she not serendipitously stopped to pet a colleague’s dog one day as a postdoctoral researcher in Massachusetts. The dog’s owner connected Sen Gupta with a marine chemist who was seeking a data scientist like her to make sense of unknown compounds in the 2010 BP oil spill. “In his signature way of awesome honesty, he said, ’You are perfect for the job because you don’t understand chemistry at all!’” she recalled. Sen Gupta successfully “fingerprinted” that spill, and has been looking at the environment as a data problem ever since. Today, as anassistant professor of electrical and computer engineering at the University of Iowa, she still lends her computational skills to environmental efforts. Hear Sen Gupta describe her work in kid-friendly terms. Sen Gupta helps a colleague in environmental engineering analyze harmful pollutants in the air and studies the spread of disease-causing pathogens with an environmental health professor. With two physicists, she’s developing algorithms to find high energy events in the Earth’s radiation belts and identifying patterns of particles in the Martian ionosphere. “I think of myself more as an applied mathematician, honestly,” she said. While her collaborators see the data through the specific knowledge of their fields, Sen Gupta only learns what she must to develop useful tools. To identify the problem and understand the data, she listens to the experts and takes detailed notes, which she later translates into her own language: mathematics. She is then able to build algorithms that identify patterns in the datasets, which are far too large for manual processing. Because she does not know what her algorithms should find, they are essentially free from the confirmation bias field experts might carry. Thus, Sen Gupta’s objectivity can add great credibility to a researcher’s findings; recall the marine chemist’s excitement at finding a chemistry novice all those years ago. “Sometimes not knowing is a good thing, because it leads to discovery,” she said. https://iowaenvironmentalfocus.files.wordpress.com/2019/02/sg-on-math.mp3Listen to Sen Gupta’s metaphor comparing mathematics to a verbal language. Environmental pollutants and pathogens tend to have complex boundaries that are difficult to define mathematically. Sen Gupta said applying existing models and equations correctly is a skill in itself, but the nature of environmental research lets her work from scratch, too. She makes the majority of her code for those inventions open source, encouraging further discovery from others who can directly use her algorithms. Though today she is busy teaching and conducting defense-related research on underwater sonar, Sen Gupta said if she could clone herself, she would devote more time to environmental issues, perhaps those related to climate change. Since she cannot solve every problem on her own, though, she calls for more interaction between other data scientists and environmental researchers. https://iowaenvironmentalfocus.files.wordpress.com/2019/02/sg-on-coffe-and-tea.mp3Learn how a seemingly aimless conversation about coffee and tea came to inform Sen Gupta’s environmental research. As she sees it, there is unlimited potential for what problems computer engineering can help solve. But such collaborations cannot occur unless experts in vastly different fields come together. Eric Tate, 2019. Photo by Julia Poska. Natural disasters are enormously costly. 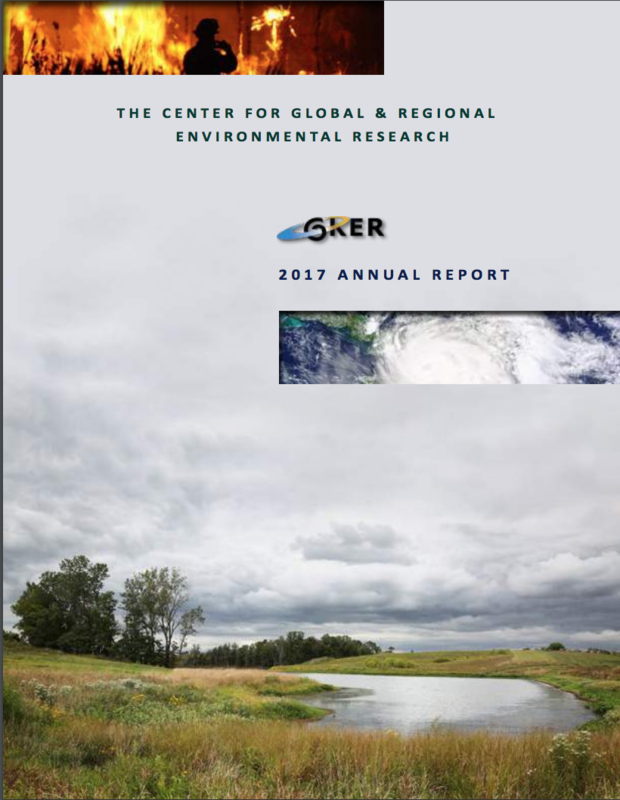 The U.S. incurred an estimated $306 billion in physical damage from extreme weather events like hurricanes and floods in 2017 alone. CGRER member Eric Tate, a professor in the University of Iowa geography department, quantifies disaster impacts in a bigger way. “Looking at these impacts just by dollars affected may not really get at the true impact of how people are affected, how their livelihoods are affected,” he said. Tate studies the social effects of disasters, with an emphasis on floods. Looking beyond physical damage, he determines how population characteristics like age, disability, education and poverty create social vulnerability to harm. Listen to Tate explain social vulnerability in his own words. Disaster impacts are typically distributed unevenly; certain groups suffer disproportionately due to social, political, economic and institutional inequalities. These processes may debilitate some households while neighbors go unaffected during the same storm. Using mainly government disaster relief data, Tate has measured and mapped the social reality of disasters like 2012’s Hurricane Sandy. He’s currently examining 2015 flooding in South Carolina. His research aims to inform planning and policy by lending insight into how various population characteristics contribute to vulnerability. Officials can use such analyses to help vulnerable populations before, during and after disasters with adjusted mitigation and primary response plans. The social dimension of sustainability is often underemphasized, but is crucial for implementing effective change. “If we want to have sustainable futures but the gains aren’t equitably shared, then is that sustainable?” Tate asked. Tate on the need for research into the spillover effects of disasters. He sees several ways policymakers on all levels can more deeply embed equity into decision making. They can model vulnerability among their constituents themselves or look to academic research that does so. They can seek to be inclusive and involve a diverse cross section of the population early on in the decision making process. Tate pointed to the National Environmental Policy Act as well, which requires the government to complete environmental impact assessments prior to undergoing all federally funded executive projects. He thinks a similar statute could mandate assessments of the far-reaching social consequences of such projects. He also advised considering climate change in proactive disaster planning, as atmospheric carbon seems to amplify climatological weather events. In Iowa, flooding has already become pronouncedly more intense and will continue to get worse in coming decades. “Regardless of your belief in climate change or not, we’re seeing changes in hydrological extremes,” Tate said. Tate on how to help protect yourself and your community from flooding. Intensified flooding will increase pressure on the already vulnerability and likely push some previously unaffected households beyond their coping capacities. Tate calls for updated statistical analysis to better inform everyone from city planners to homeowners about risk and vulnerability in different areas. The 100-year floodplain of today may become the 50-year floodplain in 15 years, but flood maps are based on historical frequencies and do not reflect projections for the future. Ulrike Passe (left) and Jerry Schnoor answer questions about the Iowa Climate Statement. The Iowa Climate Statement 2018: Designing Buildings and Communities for Iowa’s Future Climate was released earlier today at the Cedar Rapids Public Library. The statement was announced by Jerry Schnoor, the co-director of the University of Iowa’s Center for Global and Regional Environmental Research, and Ulrike Passe, Associate Professor of Architecture at Iowa State University. The eighth annual statement, “Iowa Climate Statement 2018: Designing Buildings and Communities for Iowa’s Future Climate,” released Thursday, October 11 was signed by a record 201 science faculty and researchers from 37 Iowa colleges and universities. 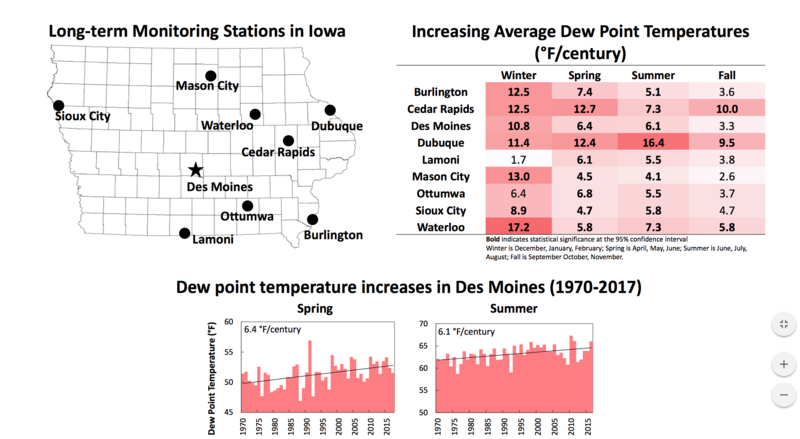 The statement describes the urgent need to fortify our building and public infrastructure from heat and precipitation and looks to the future weather of Iowa, suggesting ways to improve Iowa’s buildings to suit those changing weather patterns.